From Honolulu to New York, University of Hawai'i graduates influence the way people look at art. Meet a few of them. When two UH faculty members decided to bring the extraordinary Theatre de la Mode exhibit to Hawai'i, they enlisted the assistance of Maryhill Museum Collections Manager Betty Long. Only after contacting Long did they learn she is a UH alum. Originally from British Columbia, Long (BA 79) was attracted to Hawai'i by Manoas textiles program. She obtained her degree while surviving as a single parent. After graduation, she went to work for Honolulus Bishop Museum and was on the Contemporary Museum staff when it planned the move to its current location. She left Hawai'i for Maryhill Museum in Goldendale, Wash., primarily for the opportunity to work with the Theatre de la Mode collection. The collection features more than 150 miniature fashion mannequins dressed in 1940s apparel designed by Paris famous haute couture houses and set in elaborate theatrical stages. Besides managing the exhibit and its travel arrangements, Long is responsible for more than 30,000 pieces that make up the museums collection. She also manages records, processes donations, assists curators and installs exhibits. Ironically, Long didnt always see herself involved in art. "I wanted to be either a teacher or a nurse," she muses. She became a nurse, traveling to Europe and working on military bases during the Vietnam War. She eventually returned to school. "I was greatly influenced by my mentor, [Professor] Mary Ellen Des Jarlais, to pursue my museum career," she says. In a way, it also made her a teachershe now educates people about history and art through her exhibits. Montana-born Willa Cox (MFA 83, BA/BFA 76) has been at the Metropolitan Museum of Art in New York since 1986, working her way up from administrative assistant to supervising manager of Storeroom One. The storeroom processes all art entering or leaving the museum. Cox ensures safe handling, storage, packing and condition reports. Sound simple? The Metropolitan is one of the world's largest and finest art museums with more than 3 million works housed in a 2-million-square-foot building visited by more than 5 million people annually. Its vast holdings represent a series of outstanding collectionsthe greatest collection of Egyptian art outside Cairo; 2,500 European paintings, including the choicest Rembrandts and Vermeers; and so on. Cox relishes her constant daily contact with artwork from all time periods and countries. "I feel a limitless opportunity to continue learning and growing." She began her art studies at the University of Puget Sound but couldnt fight the urge to return to Hawai'i and finished her degree at UH Manoa. "I remember most the beautiful balance of freedom and structure in graduate schoolhaving my own dedicated studio space, plenty of time to work in it, access to the library, regular group critiques and private meetings with professors," Cox recalls. Living now in Astoria, N.Y., she continues to balance freedom with structure, enjoying painting (husband Jeffrey Saldinger is also a painter) while managing the demands of working at one of the worlds most famous museums. For 19 years, Steven Owyoung (BA 73) has been the resident expert on Asian art at the Saint Louis Art Museum. As curator of Asian arts, he has acquired rare and unique works from China, Tibet, Korea, Japan, South Asia and Southeast Asia, contributing to the more than 30,000 pieces held by the museum. His selections are displayed in the permanent exhibition galleries, and he organizes traveling exhibits. Owyoung has traveled throughout Asia in search of extraordinary pieces. He counts contemporary Japanese ceramics among his best collecting efforts. "I enjoy the hard work of getting the finest and rarest art works I can find and afford," he says. Among his favorite acquisitions: Lotus and Ducks, a pair of rare matched scrolls from the late Song dynasty; Plum Vase, a blue and white ceramic from the Yuan dynasty; Sleeping Clouds, Creeping Stones, the last teapot made by Aoki Mokubei; and a stunning pair of calligraphy screens by Nukina Kaioku. How did this UH grad find his way to Missouri? After attending graduate school at the University of Michigan, Ann Arbor, he became an assistant curator at the Fogg Art Museum at Harvard University, where he also taught for three years. "By that time, my wife, Diana, and I had two small boys who we thought should have a country life, or at least a suburban life that was steady, secure and predictable. St. Louis, in the heartland, turned out to be the very best thing for us all," he says. He and Diana, of Wailuku, Maui, dont rule out a return to Hawai'i. "I would love to retire to Maui. A small simple cottage up-country would be just the best." Together with husband Steve (BS 79), Cathy Blackburn (BFA 79) left Hawai'i in 1989 to settle in Edmonds, Wash. "We have family here. We thought we would see what opportunities we could find on the mainland," she says. 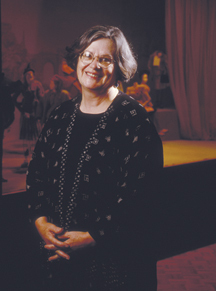 After gaining experience at the Cultural Museum of the Tulalip Tribes and the Childrens Museum in Everett, she spent five years as chief museum designer for Seattles Frye Art Museum.The Frye features 18 free exhibitions per year with a diverse range of 19th and 20th century European, American and Alaskan art. Blackburn was responsible for all aspects of visual design, including marketing, exhibition design, exhibition catalogues and the museums Web site. "I loved to walk through the galleries and see the school children sitting on the floor talking with the guides about their experience of the art," she says. >Born in Berkeley, Calif., Blackburn moved to Hawai'i in 1966 and graduated from Kalani High School. She recollects long hours in the art and photography studios and libraries as a graphic design major at UH Manoa. "Professors Murray Turnbull, Jeanne Whigg and Gordon Ashby were so important to me," she reflects. "The Honolulu Graphic Designers Association sponsored lectures by well known designers, such as Saul Bass, Michael Manwaring and Milton Glaser. It was incredibly exciting to the star-gazing young designers." Now that her three boys are well into school-and showing artistic bents of their own, Blackburn is pursuing a graduate diploma in museum studies through the University of Victoria. She recently started her own company, Designmuse, to provide consultation on museum exhibition, publication and Web design. "It never ceases to amaze me how art influences our culture," she says. "It gives us an opportunity to explore ourselves, our civilization." You name it and Gary Nomura (MFA 69, BFA 67) has done it-from staff artist and art director at KGMB-TV in Honolulu, to off-Broadway stage star, to his stint as host of the TV show The Breaks. Before Nomura left Hawai'i for the bright lights and big city of New York, UHM Professor Kenneth Kingrey advised him to look up a friend-noted fashion designer Geoffrey Beene. "Kingrey was like that," Nomura says. "So helpful and supportive." Nomura decided the Big Apple wasnt to his taste, however. He returned to Honolulu, where he began adventures in television, acting, hosting and retail. For the past five years, he has pursued his first love, art, as Bishop Museums senior graphics designer. He handles design for all exhibits, including creating add-ons for traveling exhibits and designing logos and the overall look of the museums own exhibits. He also creates flyers and brochures for museum promotion. "I was anxious to return to art again, but things had changed, especially with the advent of the computer and computer graphics," he says. "I had to learn how to use a computer in a very short time. It was a totally frightening challenge. I have a real love/hate relationship with computers." What he consistently enjoys are his colleagues. "There are some incredible people on the staff at the museum. I feel privileged to be able to work side by side with them. And I totally love and support what the museum stands for. It is an incredibly important storehouse of Hawaiian history." These things may keep him at the museum for a while; then again..."I'm open for anything. Life is full of surprises, twists and turns, and I'm still learning to relax and go with the flow." Working with Lisa Yoshihara, far right, to make Hawai'i State Art Museum a reality are fellow alumni, from left, Ronald Yamakawa, Malia Van Heukelem, Michael Okamoto, James Kuroda and Rich Louie. Just beyond the dust and noise of a major construction project are the offices of the Hawai'i State Foundation on Culture and the Arts. The staff loves the commotion. Why? Because they are seeing the result of years of planning for a venue to showcase the states art collection. When the Hawai'i State Art Museum opens this fall, no one will be prouder than Lisa Yoshihara (MFA 92, BFA 84). Yoshihara joined the state foundation in 1985. Curator of the relocatable collection of the Art in Public Places Program, she took a lead role in realizing the state museum. She discovered her passion as a UHM student when she happened upon the campus First Western States Biennial Exhibition in 1980. "I thought to myself, Wow, this is what I want to do," she explains. She remembers her UH experience as a time filled with "a lot of creativity, fun, camaraderie, collaboration with professors and peers and working in the gallery." Her UH professors not only encouraged and supported her interest in art, but also helped her form a broader view. "They taught me the importance of community service, volunteering, taking a look at the bigger picture and perseverance." Perseverance helped her earn a master's degree while working full-time. It helped her see through the enormous museum project at No. 1 Capitol District, first envisioned in the 1968 state capitol master plan. The museum will include the Diamond Head Gallery, with 6,200 square feet to display new acquisitions and thematic shows from the states art collection; the Ewa Gallery, for documenting Hawai'is visual art history since statehood; and the Sculpture Gallery and Lobby. Helping Yoshihara on the project are six other UH alumni who, like their counterparts across the country, delight in presenting art for public viewing.